Architects are developing zero-emission buildings, whilst urban designers are seeing the first eco-cities being built in China. In the stationary energy field, the atmosphere is ‘electric’ as a list of possible renewable energy sources is explored: geothermal, wind, solar, wave, biomass and geosequestration. But what are the parallel innovations in the supply chain and freight transport sector? When talking ‘sustainable logistics’ there are two discussions. One relates to the long-term innovation and visionary strategy required for post-2030 solutions, and the second relates to short-term solutions (prior to 2030). That is, what steps can be taken within the limits of our existing infrastructure and networks to reduce environmental impacts? Whilst in the short term there is no quick fix, aggressive adoption of a portfolio approach that tackles emissions from a multitude of angles can achieve significant results. One innovation successfully trialled and adopted within the European Union (EU) and Asia is a concept called the ‘freight village’, also known as an ‘urban consolidation centre’ (UCC). The concept builds upon and is complementary to intermodal solutions, but should not be confused as simply being intermodal. It has some unique aspects. What is a freight village or urban consolidation centre? The concept is that goods are consolidated within a central urban area before being decanted into ‘clean’, well-utilised vehicles for the ‘last mile’ delivery. Clean vehicles might be hybrids, vehicles powered by methane, LPG, CNG, or electric vehicles charged by renewable energy. The main aim is to tackle the disproportionate amount of greenhouse gas (GHG) emissions that is released in innerurban areas when oil-powered vehicles find themselves driving in a stop-start fashion or idling for long periods in traffic. Consolidation also aims to reduce the energy wastage incurred when multitudes of vehicles are only partially loaded. Hence, rather than having excessive and at times highly polluting old, unclean vehicles trundling around Australia’s most populated and congested areas, the idea would be that high-value locations are tightly controlled with only clean, optimally loaded vehicles having access. The positive spin-offs include commensurate reductions in congestion and improved air quality and noise levels. The freight village or urban consolidation centre concept is suited to dense, highly populated inner-urban areas and locations that have high cultural, tourism or leisure values – such as Bondi Beach! Case studies from Europe have found that when the concept is integrated into the early planning stages for a new development, it can be a cost-neutral activity. When it is an ‘add-on’ to an existing town or activity centre, start-up government funding is typically required. Old-school thinking would immediately note that consolidation brings increased operational cost to a supply chain. But when considering long-term, strategic national issues, such as climate change response, the question of cost needs to be considered with a wider lens. Unplanned transport networks that result in high air pollution compromise GHG emission reduction targets and lead to congestion, bringing enormous costs to society overall. They become massive ‘national overheads’ which impact an economy’s overall efficiency. New thinkers in Europe prefer that external costs are not swept under the carpet to only later impact other sections of the economy. Rather, their ambitious aim is to transition to a low-carbon, low oil-dependent model that shores up long-term economic competitiveness. For example, in Switzerland, external costs are captured in a very clinical way using sophisticated logistics IT and modelling to calculate the exact external cost caused by each truck trip. This is based upon the truck’s load, trip length and, importantly, the truck type and its associated clean technologies mix. Typically, for a standard cross-Alps trip, a trucking company may be charged AUD500 for external costs. However, the aim is not to penalise truckies. The new fiscal framework aims to re-jig the levers of the economy such that high polluters, (and inefficient operations, which are by default highly polluting) are increasingly penalised. Meanwhile, adopters of clean practices are provided incentives. This is the ‘polluter pays’ principle being hard-wired into an economy. Two case studies of freight villages or UCC currently operating successfully are described below. In each case, there are wins for the environment, for retailers, and for trucking companies. With that sort of scorecard, surely it becomes a ‘no-brainer’ that this idea deserves consideration within the Australian context. The freight village in Padova, Italy became operational in 2004. Since then it has experienced strong growth and has become well integrated into the cities logistic system. It is located strategically in an important commercial-industrial area, adjacent to key motorways and railway lines serving European trade, and is six kilometres from the city centre. It is run on a voluntary participation basis, whereby forwarders or companies may choose to utilise the freight villages service. Currently there are 26 participants. From the freight villages warehouse, goods are delivered into the CBD using a fleet of seven methane-gas trucks and vans, and one electric vehicle. Incentives to participate are 24 hour access to the freight villages for transport companies, which provides them far greater flexibility. Trucking companies have found that rather than having their expensive assets locked in traffic all day, these trucks can be utilised more effectively servicing ‘long-haul’ legs, saving them costs. Additionally, it is often logistic sector companies that operate the UCC or freight villages, creating jobs and new skills. The freight villages dedicated clean vehicle fleet is given preferential access to the CBD through dedicated lanes and parking areas. This is a strong advantage, as the city of Padova has introduced very tight traffic controls – such as multiple pedestrian-only zones and several ‘Limited Traffic Zones’ with tight entry windows and other restrictions. A Bocconi University study found that traffic was reduced by 300 km per day, and that over 15 months, CO2 emissions were reduced by 38.4 tonnes, with comparable reductions in NOx, VOC, PM10 and other pollutants. It also examined the costbenefits of the system in a holistic way, finding that the external costs savings, (reduced noise, accidents and energy use) were equivalent to 756,000 over a fiveyear period, which was double the amount of public grants provided for start-up. This study was important for quantifying many of the long-term and intangible benefits of the freight villages concept. The Padova experience emphasises a repeated ‘lesson learnt’: freight villages often require public support for the initial feasibility and pilot studies, promotion and the establishment phase. Similarly, complementary legislation that creates an incentive for companies to use the freight villages is vital. The UK has seen success with the urban consolidation centre concept through leveraging private sector expertise to manage and operate the centres. The UK approach is also unique for targeting a specific site, rather than offering a general UCC service for a broader suburb or city. This narrows the types of goods the UCC needs to be able to handle. The Broadmead UCC directly supports the Bristol retail area. On identifying that this complex was likely to see 40% growth between 2004 and 2009, the Bristol City Council contracted Exel to establish and operate a trial UCC in May 2004, with funding assistance provided by the EU. Planning commenced with a survey of all 118 retailers and their supporting freight task, which found that the most feasible participants were those who dealt with non-perishable goods. The UCC is located 11 kilometres, or 25 minutes, from the retail complex and has 5,000 square feet of warehouse space. Currently it serves 64 retailers. Retailers have provided very positive feedback, with 75% saying they had experienced ‘improved service and cost reduction opportunities’, 94% saying they would recommend the system, and no loss or damage claims submitted. The centre has 24-hour operations, and has reduced participating retailers’ heavy goods vehicle (HGV) traffic into the city area by an average of 75% with 20.3 tonnes of CO2 saved to date. The UCC also aims to provide a range of value-adding services for retailers. This includes packaging collection, overflow storage, and integrating the UCC into the reverse supply chain. Here retailers are assisted with product returns, and last year the UCC collected and recycled 12.9 tonnes of cardboard and plastic. Whilst initially a free service, a future sustainable business model involves participating retailers being charged a fee, and the UCC earning additional income through incorporating more value-added services. Again for retailers, this fee seems worth it as additional benefits included increased retail floor space, having 38% more time to spend with customers, less stress for staff in coordinating multiple freight agencies and deliveries, and a time saving of an extra 20 minutes a day. A solution suitable for Australia? 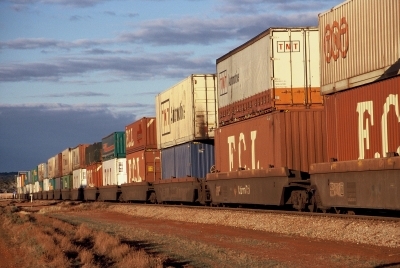 Across Japan, China and Europe, areas far more congested than Australia, freight villages and UCC are steadily cementing themselves as an important component of future sustainable freight models. They may be linked with rail, sea, inland waterways or road freight routes. Although Australia is less densely populated, congestion is still an issue, as illustrated by the recent release of Sir Rod Eddington’s $18 million plan to tackle congestion in Melbourne. In terms of climate change, however, as it is the city and urban areas where the highest transport emissions occur, this is where freight villages and UCC come into their own. They tackle the hardest climate change nut in the freight sector. To work, freight villages need to be integrated into early planning and require government start-up support, the expertise of industry experts, and a raft of supporting legislation, carrots and incentives. Tricky to get going, but once up and running, the benefits can be significant in terms of reduced GHG impact, reduced congestion and air pollution for those inner urban areas where people live and young lungs are developing. Successful freight villages rely on those already existent best-practice supply chain building blocks: collaboration and excellent logistics IT support. Whilst my impression has been that the freight sector has goodwill and is keen to be part of the climate change solution, in comparison to Europe, currently the Australian Government does not have the vision or levers in place to drive and support such innovations. Given the importance of the freight sector to the economy and community, let’s hope this swiftly changes. Elizabeth Boulton is the director of Logistick, which provides niche consulting services and workshops in the area of sustainable supply chains and freight transport strategy. Previously a logistics officer in the Australian Army, Ms Boulton has worked on logistics IT and wind-farm projects whilst studying for a Masters of Environment at the University of Melbourne. Her thesis focussed upon how the freight sector can best respond to climate change. In 2007, her expertise in this emerging field was recognised through her winning the Victorian Department of Infrastructure’s ‘Women in Freight, Logistics and Marine’ award. Visit www.logistick.com.au. Liz will be speaking at the upcoming Defence Logistics Conference – visit www.informa.com.au/defencelogistics.